Most cultures have some specific food you eat to welcome the new year and ensure luck/fortune/prosperity for the duration. Some people eat long noodles to symbolize a long life or food with names like what they want to bring about. 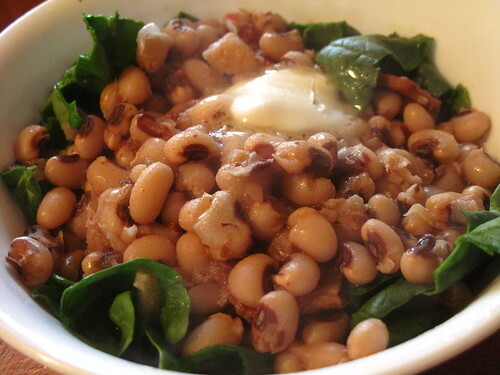 In the southern US people eat a black-eyed pea dish called Hoppin' John. 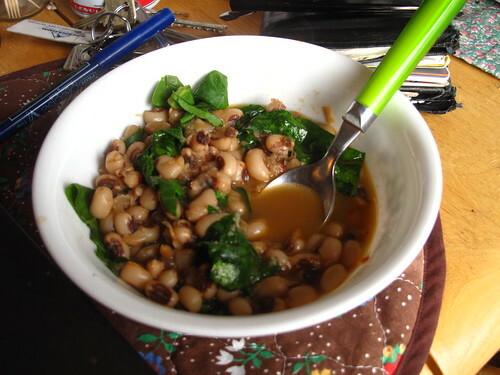 The black-eyed peas look kinda like coins, and it's often eaten with greens (the color of money) all adding up to a dish that should bring prosperity in the new year. Hoppin' John happens to be the tradition I've taken on; a little prosperity can't hurt, and the food really helps settle the morning after stomach. I have been trying to make a Hoppin' John that doesn't taste like dirt (black-eyed peas have a lovely if quite earthy flavor) for three years now, and have finally succeeded!